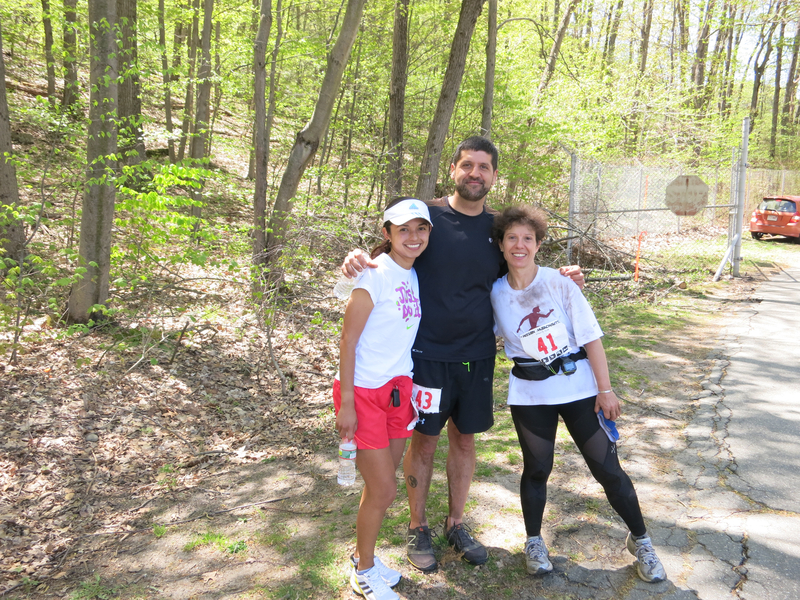 The 7 Sisters Trail Race in on the Holyoke Range in western Massachusetts is another one of those races that I had no plans on ever running…. 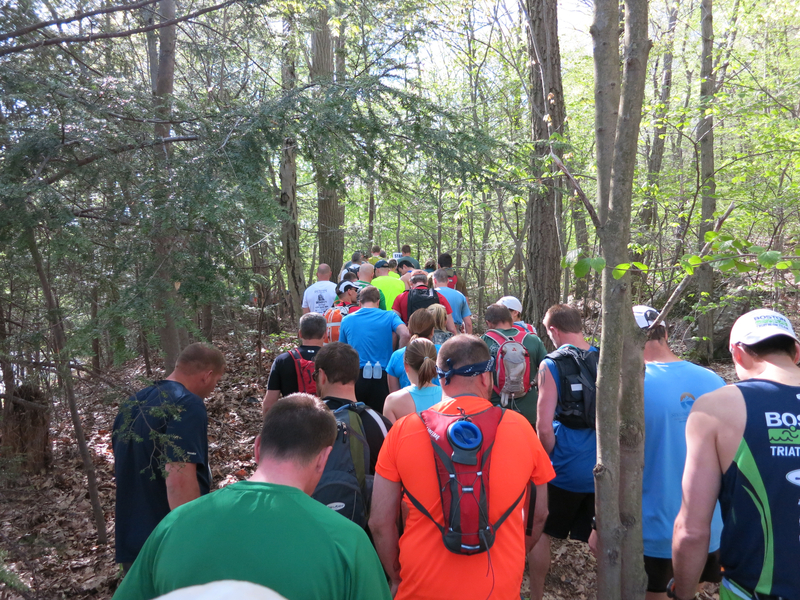 Recently rated by Runner’s World Magazine as the toughest “Up and Down” trail race in New England, the race claims 3700 feet of gain in 12 Miles. Some further investigation of online race reports and facebook posts suggested that the race was essentially a rugged hike with a little bit of jogging occasionally thrown in. Not exactly in my wheelhouse. Sealing the deal to NOT run it was the fact that 7 Sisters falls on the weekend in between The TARC Spring Classic (50K) and Wapack and Back (21.5 Miles). And then I got an email from Katya. Just a simple forwarded email confirming her registration for 7 Sisters. That’s all it took to make the wheels in my head start spinning. Well, actually, I guess it was really the voices in my head that started whispering….”Vermont 50, Vermont 50, Vermont 50…..”. Elevation gain and “tired legs” training are sort of the name of the game these days, so I signed up. Another absolutely gorgeous weather race day arrived. My friend Carolina and I carpooled for the 1.5 hour drive out to Amherst, MA. We would meet Katya there. We grabbed our race bibs and had a look at the race t shirts that they were selling. They had a dark blue cotton shirt with a pretty cool logo for 15 bucks, so I grabbed one. Carolina was pretty bummed out because she REALLY wanted a shirt, but they didn’t have any small ones. While grabbing our stuff, we started hearing whispers that the Port-o-John situation was pretty bad. Katya had walked over and estimated a 45 minute wait. We rushed through our pre-race preparations and hurried over to get in line. The line certainly wasn’t 45 minutes long, but it was pretty bad. When I finally made it to the front of the line, it was 8 minutes before race time and there were at least 50 people behind me still in line. With only 3 Port-o-Johns for 400 people, this was the first indication that the number of registered runners had swelled this year beyond the organizer’s expectations. 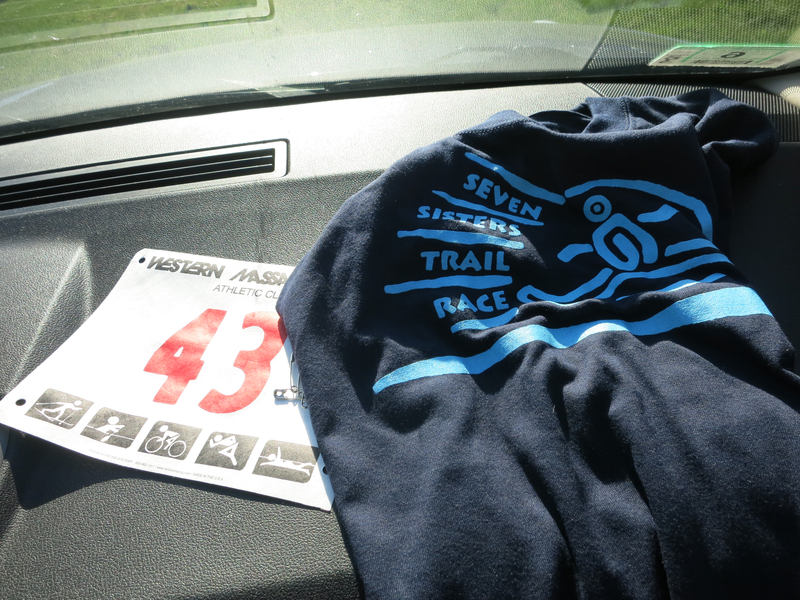 bib and cotton race shirt. 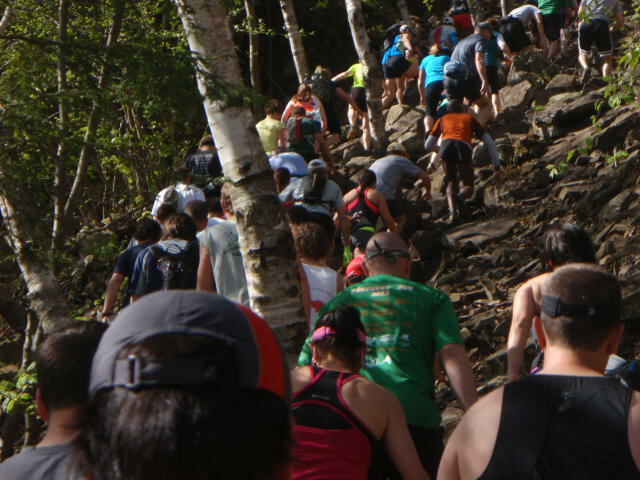 For the race start, runners were funneled into a short double-track trail which lead down to the starting line at the base of a steep climb. Katya, Carolina and I were chatting and waiting for the race to start when, out of the corner of my eye, I noticed people running up the hill! We were barely moving in a crowd and the starting line was still a good 100 feet ahead of us, but the clock had apparently started! I started my garmin and waited to get to the starting line. At this point, the race has already started! Waiting to get to the starting line. waiting to get to the starting line after the race has already started. After a minute or so, we crossed the starting line and headed up the hill. 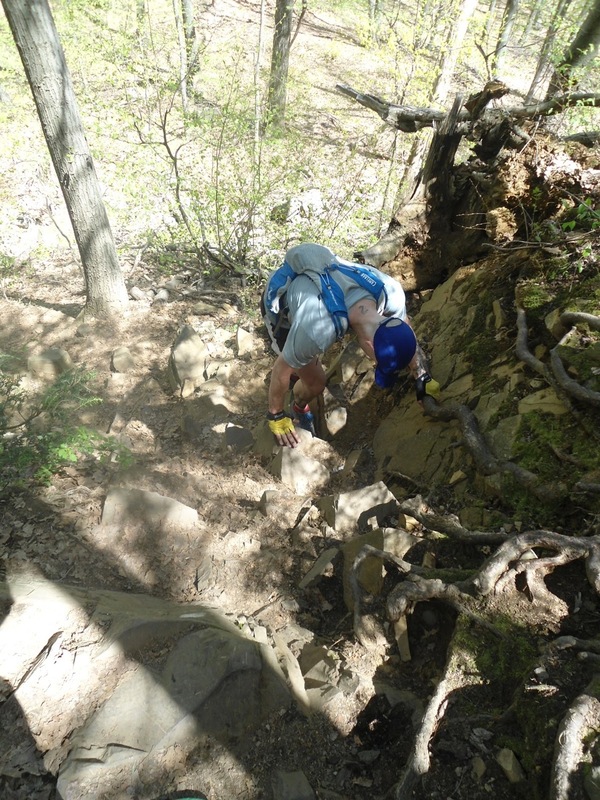 The first hill would turn out to be one of the least steep climbs of the course. 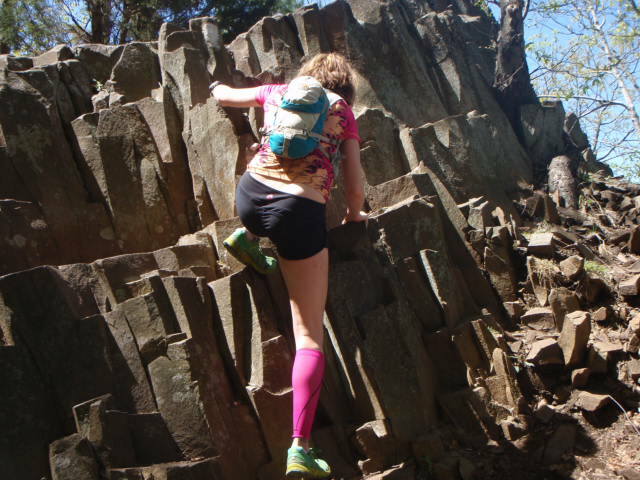 Because the trail was littered with shards of Basalt rock, the hill sounded like a thousand wind chimes as hundreds of runners crunched the rocks under their feet. That was just about the last happy thought I would have for the first half of the out and back race. 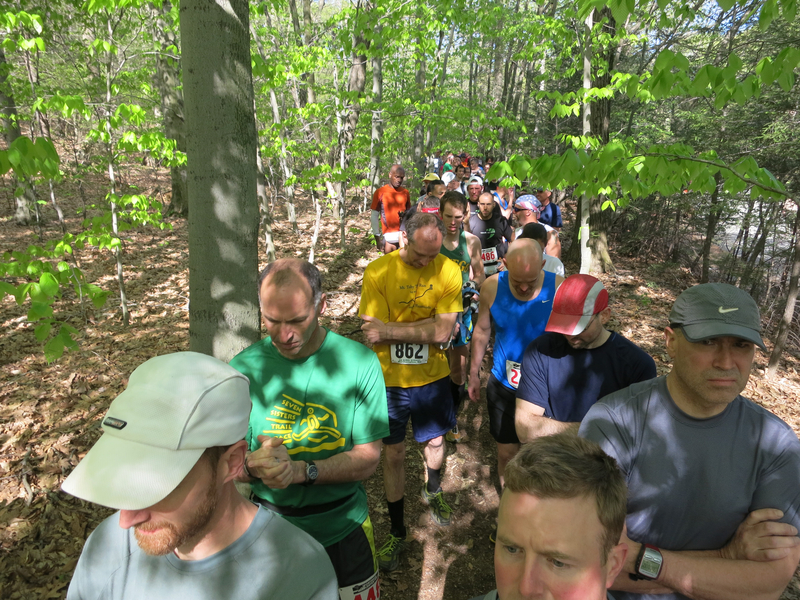 Just about any race that starts on a trail is going to have some bottlenecking and result in some traffic. The only way to really avoid it is to place yourself up at the front of the field with the speedy guys when the race starts. Because this type of super-hilly race is so far out of my normal comfort zone, I didn’t want to start too close to the front. I was afraid that I would just be in too many people’s way. As it turned out, not all people think the way I do. After two miles or so, I still wasn’t able to move anywhere near the pace I wanted to. It became evident that: (1.) The race was oversold for the format. (meaning that they were jamming too many people at once onto not enough trail space.) and (2.) There were many people who were REALLY out of their element and should have started the race in the very back, if at all! If I had to give my race report at that point, it would have been absolutely scathing. Fortunately, things were about to get much better. Finally, somewhere near mile 5, the field somehow seemed to spread out. I don’t know what the name of the hill is, but it’s the only summit where you can see views in all directions. We ran over a few large boulders, onto a short section of pavement, and suddenly there were only a couple of other runners with me. I breathed a sigh of relief at the though of being able to try to push harder for the rest of the race and headed back into the woods. I was the only one of the 10 runners that I came in with to head right back out. I wouldn’t see any of them again. The back half was a completely different race! I was able to start pushing myself up the hills and run without hinderance on the flats and downhills. I began to not only be able to take in and appreciate the terrain, but to challenge myself to move over it as quickly as possible. I started targeting runners ahead of me and trying to catch them. 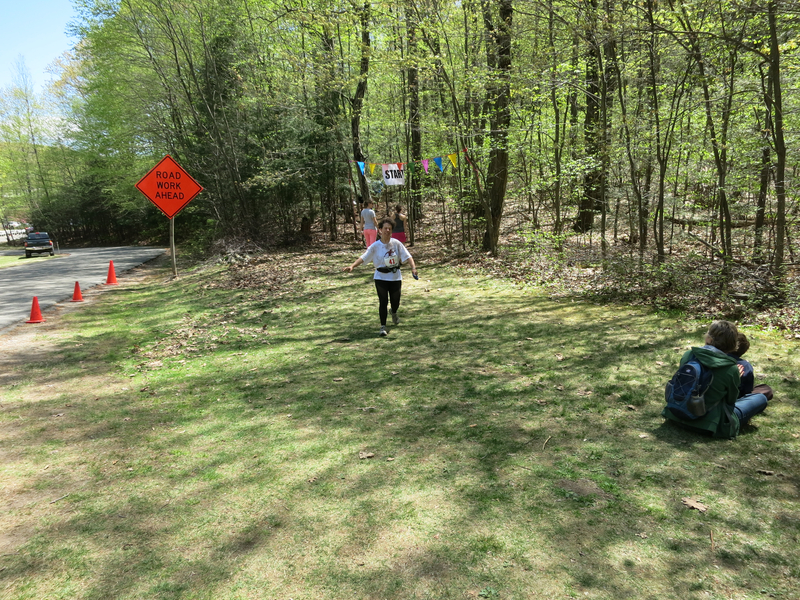 In the end, between the runners that I left at the aid station, and runners I caught on the way back, I would estimate that I made up 30-40 spots on the back half of the race. A few guys passed me at one point, but I caught up with all but one of them who ended up crossing the finish line just a few seconds ahead of me. The second six miles definitely pushed my climbing and descending abilities. I was happy and feeling sufficiently beat up when I heard the “wind chimes” indicating the finish line approaching. I finished 133rd out of 384 in 2:51:43 (officially). My garmin gave me a final tally of a little over 4,500 feet of elevation gain on the course in just under 11 miles. Here are some borrowed shots from Heather Gannoe’s Blog RunFasterMommy.com showing the terrain runners face at 7 Sisters. Thanks Heather! The second half of this race completely salvaged the experience for me. I was able to see why the race has become so popular. Plenty of post-race food and drink were waiting for me while I hung out and waited for Carolina and Katya to finish. Someone even showed up with a bunch of fresh pizzas! Carolina did well and enjoyed the race, finishing in around 3 hours and 25 mins. Katya was about a half hour behind her, having had a pretty tough day. Carolina, Katya and I after the finish. Gear Used: Garmin Fenix, Inov8 TrailRoc 255’s, Orange Superfeet, Ultimate Direction handheld, Hammer Gels, Salt Stick tabs. Post Race Notes: Results were posted very quickly the day after the race! Furthermore, the RD Fred Pilon, emailed out a PDF of preliminary results along with a call for feedback on the race. I replied to the email letting him how much I enjoyed the essence of the race, but let him know about my frustrations with the traffic during the first half. He replied VERY quickly, letting me know that they were aware of it and making plans to make adjustments next year including a possible wave start and chip timers. There is no question in my mind that these guys are absolute top notch event organizers and that they will have this race humming the way it should be in the future!